A single-board heater system is a low cost, open source, lab-in-a-box setup. 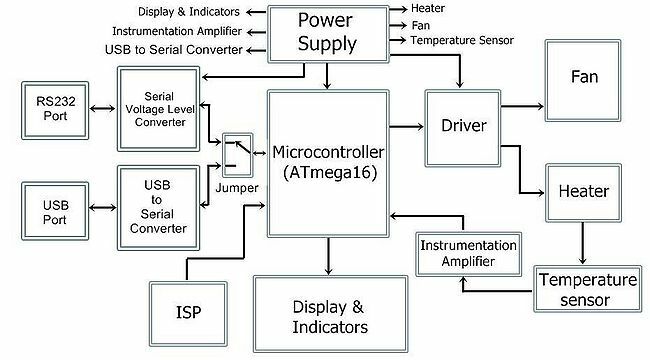 It consists of a heater assembly, fan, temperature sensor, ATmega16 microcontroller and associated circuitry. A block diagram representation of the same is shown in figure below. A stainless steel blade whose temperature has to be controlled serves as the plant. Nichrome helical coil with 20 turns kept at a small distance from the steel blade, acts as the heater element. AD590, a monolithic integrated circuit temperature transducer, is soldered beneath the steel plate. A computer fan, a low cost and commercially off the shelf component, is used to cool the plate from below. The plant has a small time constant, less than a minute, that allows completion of an experiment in a short time. This in turn facilitates performance of a large number of experiments in a single laboratory session. The speed of response not being too fast allows the measurements to be seen with naked eye, as it happens in industrial systems. It also demonstrates other measurement issues, such as, noise. The codes for hardware interface and control experiments, and manuals are available at https://sbhs.fossee.in/. In these series of tutorials we would talk about the hardware device, its features and components. We would also talk about how to access this device using Scilab. These tutorials are made for both Ubuntu-Linux as well as Windows Operating System. We would also see how to access the SBHS device remotely under Virtual Labs project. 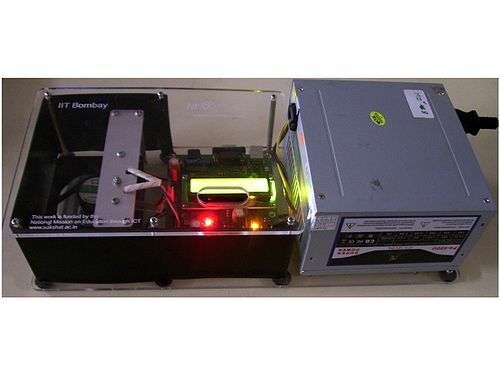 This device aims at serving a small portable lab for an individual or an institute. The application of this device is in the Control Systems area of Engineering. All Undergraduate level experiments and most Post graduate level control experiments can be performed on the SBHS device. The user is however expected to have a fair understanding of Control System terminologies, for example Transfer Function. The Spoken Tutorial Effort for SBHS is being contributed by Anuradha Amrutkar, Shalini Shrivastava and Rupak Rokade from IIT Bombay. The preliminary work on SBHS was contributed by Inderpreet Arora and Kaushik Venkata Belusonti, former students of IIT Bombay. This page was last modified on 27 March 2018, at 07:28.